Cal Poly’s dance department will end their 2017-18 season with a spring dance concert May 23 through 25 at 8 p.m. in the Alex and Faye Spanos Theatre. Titled Catalyst, the performance will feature student-directed and choreographed performances. Students from various majors have come together to create a show featuring dance styles from jazz and ballet to contemporary and hip-hop. 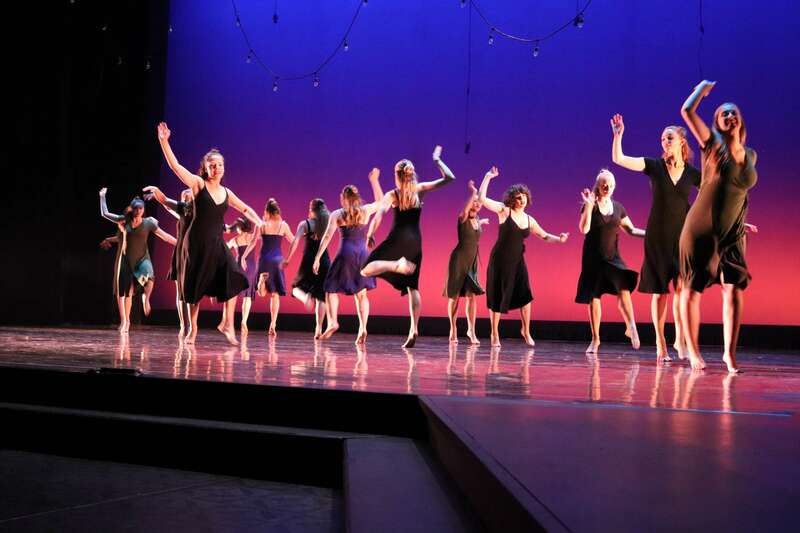 “We named the show Catalyst as a testament to the work the show does for the dance program, acting as a moving force to get people more involved,” psychology senior Aubrey Young said. Young is one of the three student directors organizing the show of 165 dancers, along with sociology senior Anna Charney and kinesiology senior Jackie Schloemp. All three directors have been actively involved with the dance program during their time at Cal Poly. Planning for the show began during Winter 2018 once the trio of women were selected. After finding their choreographers, they auditioned dancers. Since then, they have been working on a variety of duties from costuming and publicity to organizing the order of the routines and the overall design of the show. “It is the epitome of Learn by Doing, having a completely student-directed show,” Young said. To be eligible for Catalyst, performers had to have taken one dance class at Cal Poly. Anyone who auditioned was given a spot in at least one piece but no more than three pieces. There are a total of 18 student choreographers creating 19 pieces, with the largest piece featuring 21 dancers and the smallest with six dancers. For some dancers, this will be their first time performing in a show at Cal Poly. For other seasoned veterans of the stage, it is a chance to get on stage one last time. Young has noticed that people who participate in the spring concert often come back to perform again. Tickets for the show are available for purchase online at pacslo.org at $10 for students and $15 for general admission.